The average number of police-reported sexual assaults spiked in Canada after the emergence of the #MeToo movement last fall — but that hasn’t led to an increase in criminal charges. The agency said the jump doesn’t necessarily reflect a rise in the prevalence of sexual assaults in Canada, but likely is attributable to an increase in the number of victims willing report to police. “Cases that would have been previously classified as unfounded are now being founded, but consequently, proportionally more are going unsolved,” notes the report. ‘Unfounded’ is a designation applied to a complaint when police determine through investigation that an offence did not occur. 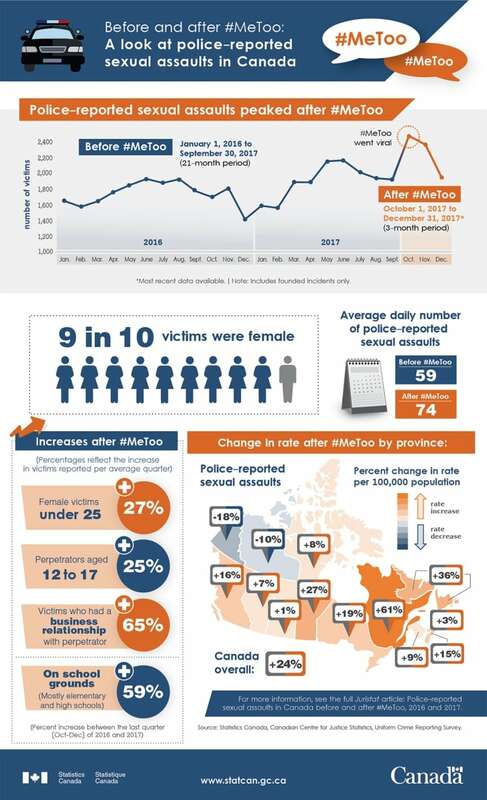 “Changes in police practices explain some of these shifts, given that when more sexual assaults are founded, a lower proportion may be solved as a result,” said Statistics Canada. Statistics Canada’s report on Canada’s sexual assault figures also takes a closer look at those doing the reporting. “Overall, victims of sexual assault were disproportionately young women and girls. Over half of sexual assault victims in 2016 and 2017 were females under 25 years of age, a proportion which was similar before and after #MeToo,” notes the report.